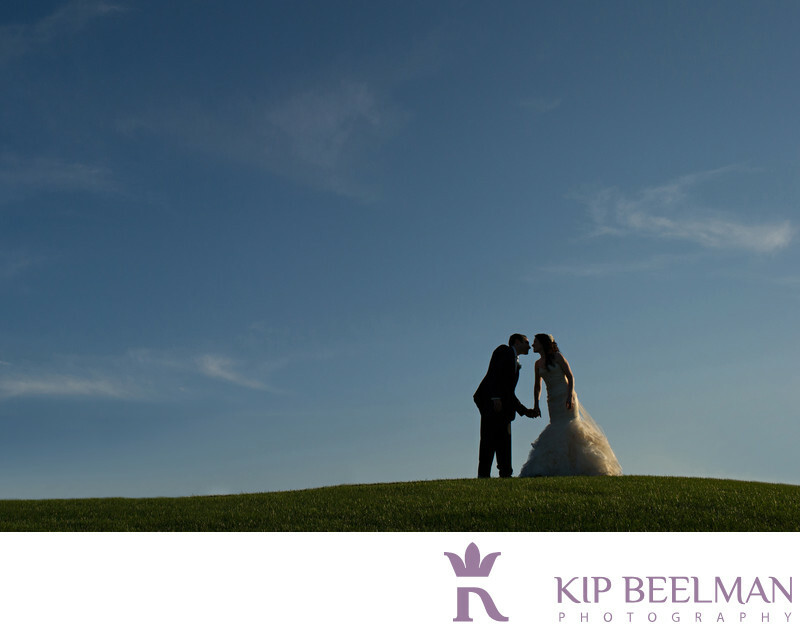 Spring Valley Country Club wedding photography offered sumptuous views for every season, including this sweet image that was taken during a break from the newly married couple’s reception as the evening light shimmered and shimmied across the hillside. Love is clearly in the air on this sun-soaked wedding day. This Jewish wedding in Sharon, Massachusetts featured a trifecta of tradition, nature and celebration, including the Bedeken or veiling of the bride, a Chuppah wedding canopy that was historically designed as protection for the couple as well as a ketubah reading and the traditional delight of breaking of the glass after the newlyweds were announced. A natural, 200-acre golf course in Sharon, the Spring Valley Country Club provided many hole-in-one locations for beautiful outdoor wedding photography, including this blue sky shot. We also took a series of wedding party portraits in the shade of some tall green trees on the club’s manicured golf course, adding pops of color to the bride’s white dress and groom’s black tux. The setting was at once enchanting and dramatic – complete with elegant chandeliers, floor-to-ceiling glass windows to let in more light, inspired food and scenery, and, fortunately, an oversized dance floor that was well used during the reception that evening. The night and party continued with the hora circle dance, the cheers and musical energy of “Hava Nagila” and many, many reasons to celebrate. Outdoor fire pits lent even more light, warmth and crackle to an incredible wedding day. Spring Valley Country Club provides an ideal location for wedding photograph spring, summer, fall and winter. Danke thanks to Zev Fisher for having me along. Location: 25 Tiot St, Sharon, MA 02067. Keywords: Golf & Country Club Wedding (9), Jewish Wedding (18), Massachusetts (6), Sharon (3).